With the number of homes available for sale at a 14-year low, the well-priced homes that are on the market are often getting full-price offers or better in record time. 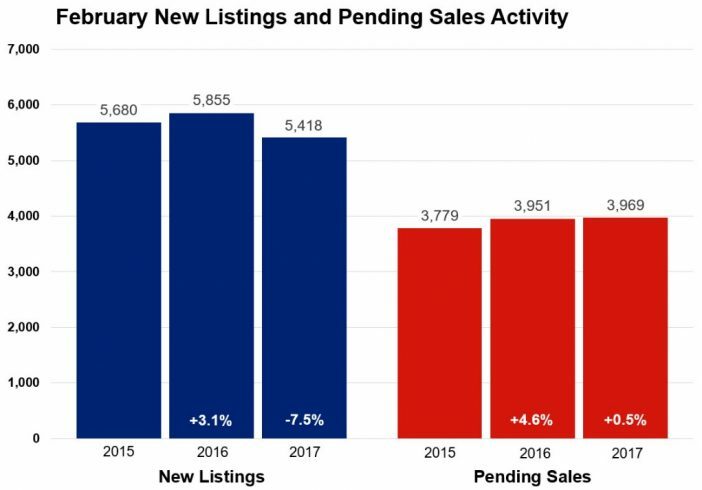 Active listings continue to drop, they’re currently down 25.3 percent compared to last February. Those shopping for homes have 8,820 options from which to choose. But not enough sellers are taking advantage of the opportunity to have their listing truly stand out. New listings declined 7.5 percent to 5,418, while buyers signed just slightly more contracts this February compared to last. Pending sales increased 0.5 percent from February 2016. The fact that contract signing hasn’t slowed down despite the supply constraints is testimony to the determination of Twin Cities home buyers. Closed sales, on the other hand, fell 18 units shy of last year’s levels. The median sales price increased 7.6 percent from last February to $223,000. Competing bids in the form of multiple offers on attractive properties in the most desirable neighborhoods are common in low inventory environments. Properties also tend to sell quickly and for close to or above list price. Average days on market until sale fell 14.6 percent to 82 days compared to 96 in February 2016. The average percent of original list price received at sale was 96.5 percent, 1.4 percent higher than last February. Given the strong demand and weak supply, our market has only 1.8 months of supply—the second lowest figure on record for any month since January 2003. This indicator measures the balance between supply and demand. Generally, five to six months of supply is considered a balanced market. A thriving local economy has been conducive to housing recovery. The most recent national unemployment rate is 4.7 percent, though it’s 3.6 percent locally. The Minneapolis–St. Paul metropolitan area has one of the lowest unemployment rates of any major metro area. Private job growth has also exceeded expectations lately. The average 30-year fixed mortgage rate stands at 4.17 percent, still well below a long-term average of roughly 8.0 percent. Many observers are expecting the Federal Reserve to increase their target federal funds rate at the March meeting. Barring any unforeseen events or economic data surprises, the Fed is likely to make at least one more rate adjustment in 2017. Job, wage and inventory growth are key to offsetting affordability declines brought on by higher rates. Dear sellers, now is your time to shine!